Within almost any asset class, investors want to know, what is the “yield” on the investment? So why would anyone expect, ex-ante, bond investors to be any different? Of course, who doesn’t want a higher yielding bond? The paper we examine below shows that since bond investors tend to reach for yield, i.e. driving up prices and lowering the expected returns, it appears (on paper) that one can “reach for safety” and outperform. Here is a link to the paper, “Reach for Safety,” by Johnny Kang, Tom Parker, Scott Radell, and Ralph Smith (all from Blackrock). Figure 1, shown below, highlights the main idea of the paper. Within equity investing, it is well known that the security market line in U.S. stocks is flatter than what than what the CAPM model would suggest–meaning that higher beta stocks tend to have lower returns than one would expect according to the CAPM model. The paper then examines the same idea within the bond market, as is shown in Panel B. 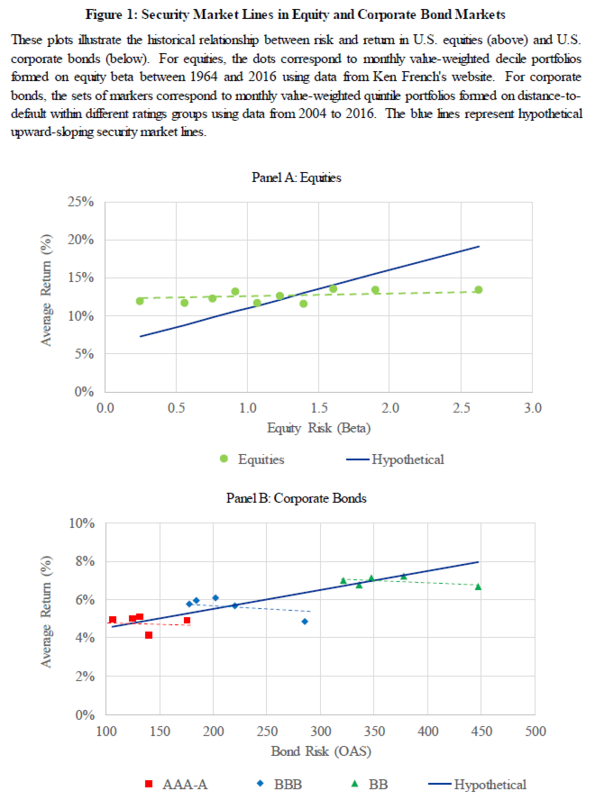 Unlike Panel A, which plots average returns against beta, Panel B plots the Average return to Bonds against the Bond Risk, as measured by the option-adjusted spread. Bonds with higher option-adjusted spreads (OAS), all else equal, should have higher expected returns as these are expected to be riskier investments. In Panel B, the data shows that within a specific bond investment class (AAA through A, BBB, and BB), as the OAS increases (i.e. higher yields), the average return realized actually decreases! Thus, if investors are reaching for yield, thereby pushing prices up and decreasing expected returns, one may be able to reach for safety to beat the benchmark (within each category). Below we dig into the paper and the results. To begin the paper, the authors highlight some of the literature that gives an insight or reason why investors may originally reach for yield. For example, Becker and Ivashina (2013) report that insurance companies, some of the largest institutional holders of corporate bonds, exhibit an abnormal preference for higher yielding securities. Since insurance companies are subject to risk-based capital requirements, the authors use NAIC risk-based ratings categories to identify variation in reaching for yield behaviors. We draw inspiration from this methodology and also use ratings categories in defining our factors. Hanson and Stein (2015) show that commercial banks behave like yield-seeking investors with a particular bias towards longer term securities, especially when interest rates are lower. In other words, these investors tend to reach for yield and risk by extending the duration of their portfolio holdings. 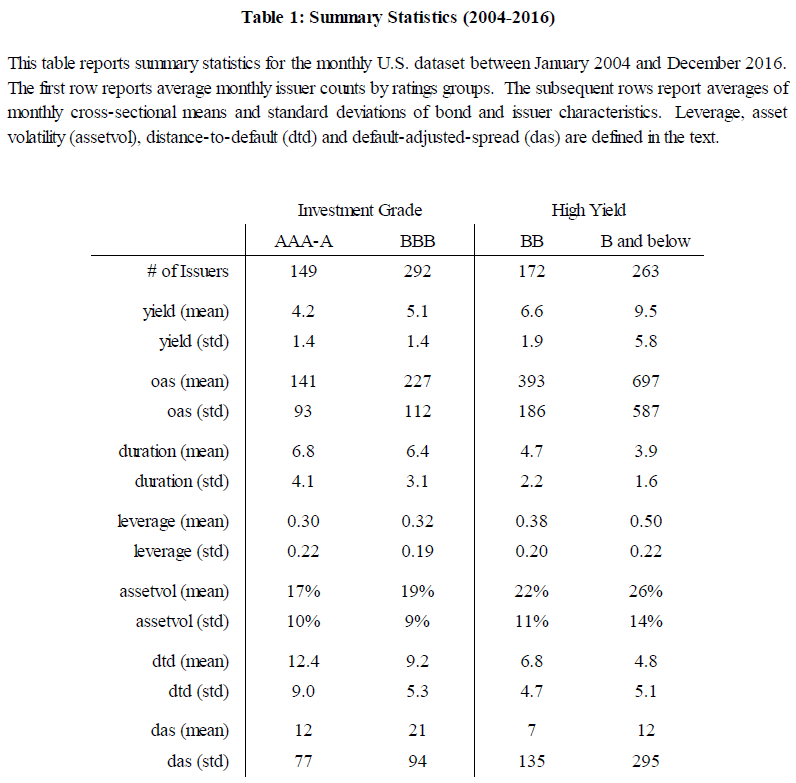 Choi and Kronlund (2017) find that corporate bond mutual funds also reach for yield, especially when bond yields are low and credit spreads are narrow. Thus, it appears there is evidence in the literature that (some) investors tend to reach for yield. The paper then digs into the details on the sample of bonds they examine. Table 1, shown below, gives the summary statistics from 2004-2016 for the bonds examined in the paper. Both the Investment Grade and High-Yield categories as split into NAIC Categories. This is done as (some) investors use this classification when making investment decisions, as well as pre-set guidelines (i.e. a manager can only have x% of NAIC category 3 or 4 bonds). As is shown above, the average yield, OAS, leverage, and asset volatility increase as the credit quality decreases, while the duration decreases with credit quality. There are two additional variables in the summary statistics table, (1) dtd and (2) das, which warrant explanation. In the paper, “DTD” is defined as the distance-to-default (DTD). (1) At a high-level, this measure uses inputs such as leverage, prior-year stock return, and asset volatility (to name a few), to generate a DTD value. A higher DTD value indicates a safer company. Not surprisingly, the DTD measure decreases with credit quality. The paper uses this measure within the analysis as the “quality” measure. The intercept controls for factors driving the general level of credit spreads, while the slope controls for the price of default risk across issuers. We estimate default-adjusted-spreads by taking the exponential of the residuals from this regression. A high (low) residual indicates a bond trading at a relatively low (high) price relative to its default risk, thereby indicating that it is cheap (expensive). While it is certainly possible to introduce additional variables in this regression or to consider alternative methodologies, we prefer this simple regression that yields a residual orthogonal to distance-to-default. So how does one form portfolios given this information? The paper standardizes each measure, by subtracting the cross-sectional mean and then dividing by the cross-sectional standard deviation–this is done using the mean and standard deviation within each NAIC category (as opposed to the overall average and standard deviation). Portfolios are then formed by sorting bonds into quintiles based on the standardized quality and value scores. 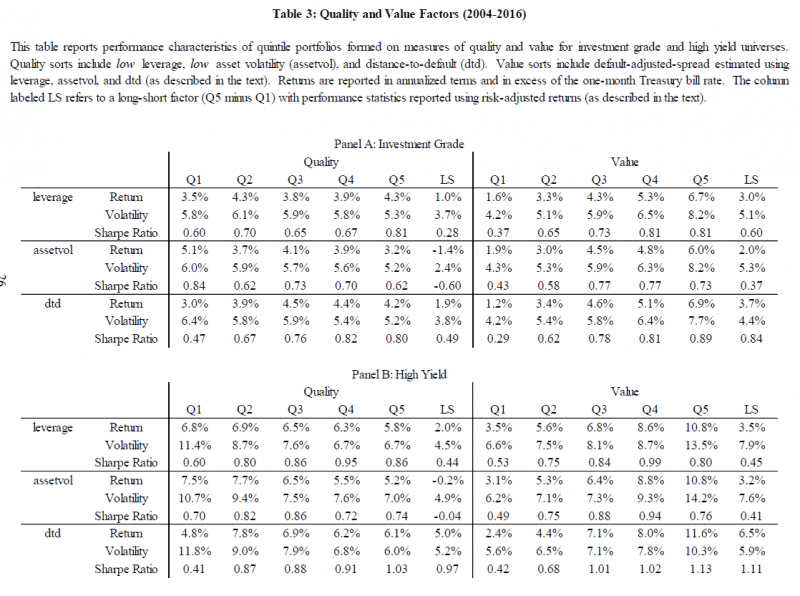 Table 3 shows the results to sorting portfolios on either (1) quality or (2) value for both Investment Grade (Panel A) and High-Yield (Panel B) bonds. The Quality measure quintiles are pretty straight-forward–the paper uses the standardized(4) (1) leverage, (2) asset volatility, or (3) DTD measures to sort bonds (within Investment Grade or High-Yield categories) into quintiles. Examining the quality results above, one sees that DTD has the strongest results when examining the quintiles, compared to the alternative measures: leverage and asset volatility. Thus, the paper recommends using DTD as the main quality score. Turning our attention to the Value quintiles, a quick description is required to fully understand the table. (5) The paper uses a similar regression described in Equation 1 above but instead regresses the OAS against (1) leverage or (2) asset volatility. The paper then sorts firms into quintiles based on their standardized, exponential of the regression residuals, from regressions against (1) leverage, (2) asset volatility, or (3) DTD. Examining the results, one finds that the DAS measure (standardized, exponential of the residuals generated from regressing OAS against DTD) has the most prevalent pattern of increasing Sharpe ratios from low to high. Thus, the paper recommends using DAS as the main value score. Examining Table 3 again, we note that the bottom quintile generally has very poor (relative performance) using both the quality (DTD) and value (DAS) scores. Examining the results above, one first notices that the portfolios had a higher return and Sharpe ratio by simply eliminating the bottom quintile firms on (1) Quality, (2) Value, and (3) the combination of the two measures. 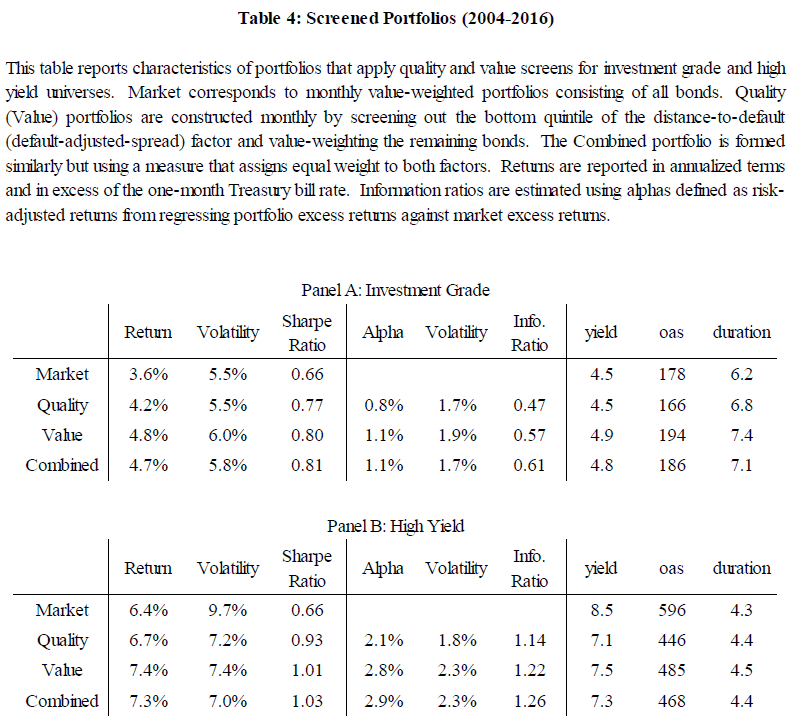 For the Investment grade portfolios, the combined portfolio had a slightly higher yield, OAS, and duration. However, for the high-yield portfolios, while having a higher return and Sharpe ratio compared to the market portfolio, the combined portfolio has a lower yield and OAS, with similar duration! The paper finds even stronger results in an optimized portfolio (described in the paper, not shown here)–however, the big-picture takeaway is the following: by simply eliminating the bottom quintiles on quality and value, a bond investor would have generated higher returns and Sharpe ratios than the market bond portfolio, before transaction costs. Thus, this appears to be a simple strategy(7) one can implement within the bond market, and is different than a bond strategy sorting on Value and Momentum. In the corporate bond market, investor propensity to reach for yield creates an opportunity for factor-based investors to “reach for safety” following an economic intuition that parallels low-risk factor investing in equities. Given this insight, we motivate a measure of credit safety based on the Merton (1974) distance-to-default variable, which we use to define quality and value factors. We demonstrate that both factors help explain the cross-section of corporate bond returns in an uncorrelated and complementary manner. Since these factors have performed particularly well in their bottom quintiles, we demonstrate how they can be used as screens within long-only portfolios. In addition, we show how incorporating our quality and value insights in a long-only optimization setup can generate significant outperformance net of estimated transaction costs versus traditional value-weighted market portfolios. Please read the paper for full details. This is based on the Merton 1974 paper. I would recommend that the authors split this table into 2 tables, one for quality and another for value–in my opinion, the current layout can cause confusion for the reader. It should be noted that the optimized portfolio shows outperformance even after accounting for turnover and transaction costs. Assuming one has the data! The post "Bond Investing: Reach For Safety" appeared first on Alpha Architect.